The modern generation is always in a scurry. If not for the efficient kitchen appliances, our lives would have been far more unorganized. One such magnificent gizmo is a dishwasher. Dishwashers play an efficacious role in our lives by lending us a helping hand in our kitchen with cleaning dirty dishes. Dozens of FAQs have so far been raised about dishwashers. Today, I answer 5 of the most common ones. 1. How to Use Dishwasher Pods? Many of you may very well know but others may still be unaware about dishwasher pods. Let me begin with a brief introduction about dishwasher pods. Dishwasher pods are basically little capsules consisting of sufficient concentrated detergent for a single wash cycle. Such small capsules are coated with a protective water-soluble film that breaks down and melts in water to dissolve itself in it. This releases the encased detergent resulting in an effective and operational washing cycle. Most pods contain PVA (Polyvinyl alcohol) in their films. 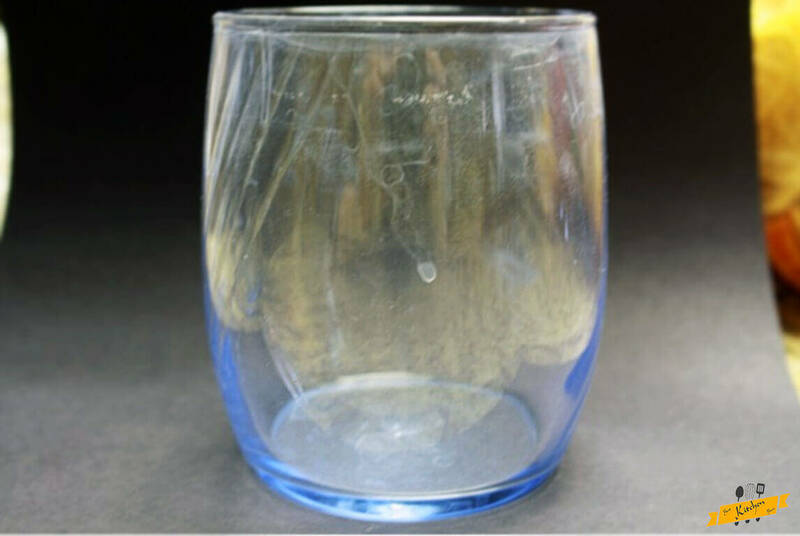 PVA is a synthetic polymer that is shelf-stable and easily dissolvable as well. This means you could easily put these pods in a pantry (dry conditions assumed, of course). Now let’s get into the main question of how you should use these pods. To know this, read the following simple steps. Step 1: At first, make sure your hands are absolutely dry and then take out a pod. Remember that wet palms would cause the film to dissolve. Step 2: Now initiate the dishwasher’s Main Wash or Normal Wash cycle and put the pod inside the compartment. Shut the lid and the film will eventually start to melt once you start the cycle. Step 3: To start the cycle, press Light Wash or Normal Wash, or any other Wash options that your appliance has. And then press the Start button. As simple as that! This is how you use dishwasher pods. 2. What can I substitute for Dishwasher Detergent? Imagine you are in a hurry and you need to get your filthy plates and dishes cleaned before the guests arrive. But Unfortunately, you are out of detergent! Now, what would you do in such a state?We pray you do not fall in such a mess. But if you do, don’t you worry. We have this solution for you. Here’s what you could do in such a circumstance. The only basic ingredients you would need is baking soda, dish soap, salt, and water. Put the dirty plates and dishes in your dishwasher just like you always do. Now take a detergent cup and fill the cup with a two-thirds portion of baking soda, a few drops of regular dish soap, and a pinch of salt. Use this recipe just as a substitute for the dishwasher detergent. This substitute works like a charm and rewards you with clean and shiny dishes! As a bonus, you’ll also save some bucks as this recipe would cost you much lesser than a packet of dishwasher detergent powder. Related: Dishwasher Size Chart- Which one should you select? 3. What is the symbol for Dishwasher Safe? Did you know that not every dish and utensil is dishwasher safe? No matter how much you hate to acknowledge this, you cannot merely just throw any filthy dish in the dishwasher. Some dishes are simply meant to be manually washed with hands. There is no typical official symbol for symbolizing care and caution in all dishware. 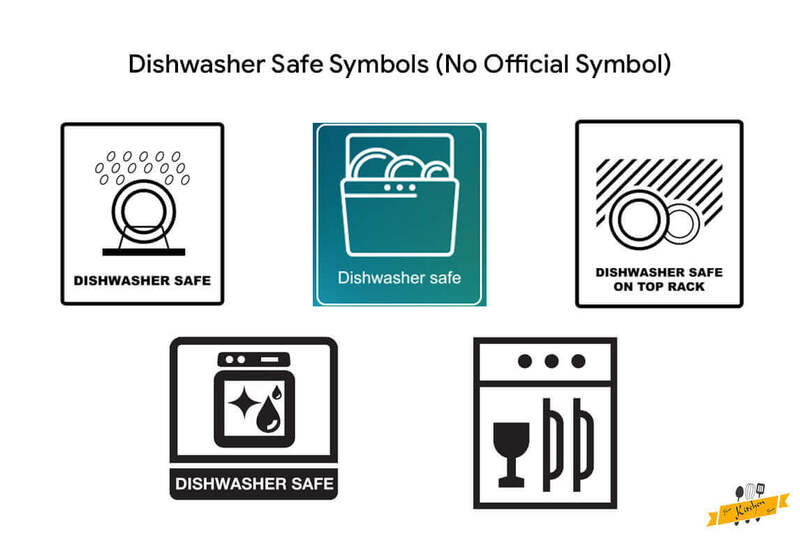 However, modern plates and utensils come with a phrase or symbol with an indication of being dishwasher safe. Some plates are symbolized with “dishwasher safe”, “heatproof” or “ovenproof”. You may also find indicative labels or images of plates or glasses put in the dishwasher. 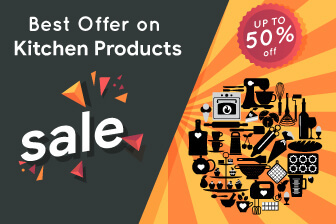 These labels and images may vary from company to company. Some labels come with an upside-down chalice with a few water droplets. On the contrary, one of the hand washing dishware symbols show a bucket filled with water, or a hand in a bucket filled with water. As said earlier, there are numerous varying symbols used across the states. These symbols are however often marked on the underneath of the dishware or on the container of the dishware. If you do not find any symbol regarding your crockery being dishwasher safe while purchasing, consider asking the retailer for more info. If you still do not find any valid answer to your query, search for the company’s website and you would hopefully get to know the answer. 4. How do you use the Dishwasher gel? Before knowing how to use dishwasher gel, I would like to give a brief knowledge about it. Dishwasher gel is a special type of detergent used for dishwashers. It is either liquid or powdered. It is unlike the regular dishwashing detergent that we usually use. Dishwasher gel does not create too much soapsuds unlike regular dishwashing detergents. This property makes it a preferred option over dishwasher detergent. If you put dishwasher soap instead of gel in the appliance, then there are chances of water getting overflowed from it as there would be too much formation of soapsuds. And it might also leave white residue on the dishes. How to use dishwasher gel? 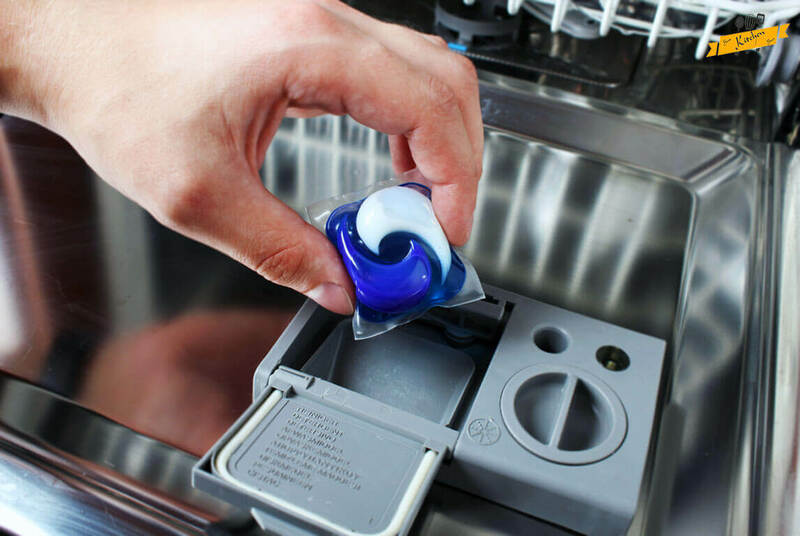 Step 1: Take the required amount of detergent gel. If you do not have any idea of how much to use, follow the instructions on the packet. Step 2: Open the dishwasher door and put the dish detergent into the dispenser. 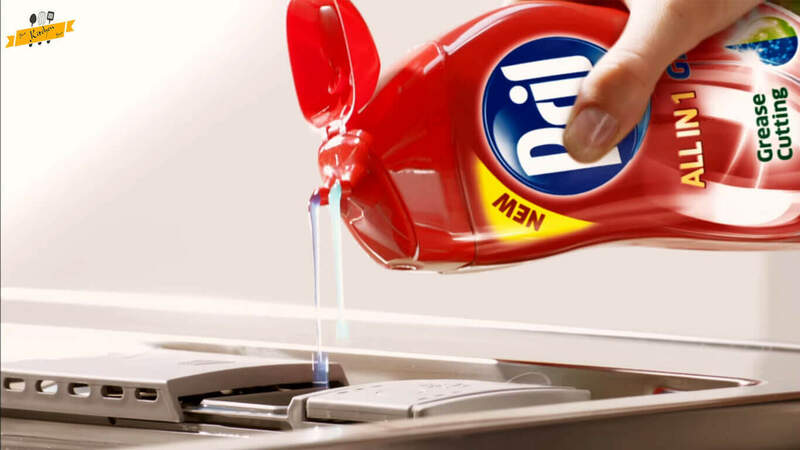 Don’t forget to wipe dry the detergent cup as it could have some wet residue in it. Step 3: Firmly shut the lid of the dispenser and throw the dirty dishes into the appliance. Step 4: Press “Start” to begin the wash cycle. 5. What causes white residue on dishes from dishwasher? And how to fix it? Isn’t it infuriating to find white deposits on your dishes after you’re take them out of the dishwasher? We present you a number of reasons that could cause this problem, and also the ways to fix it. Hard water contaminated with mineral deposits could cause this problem. 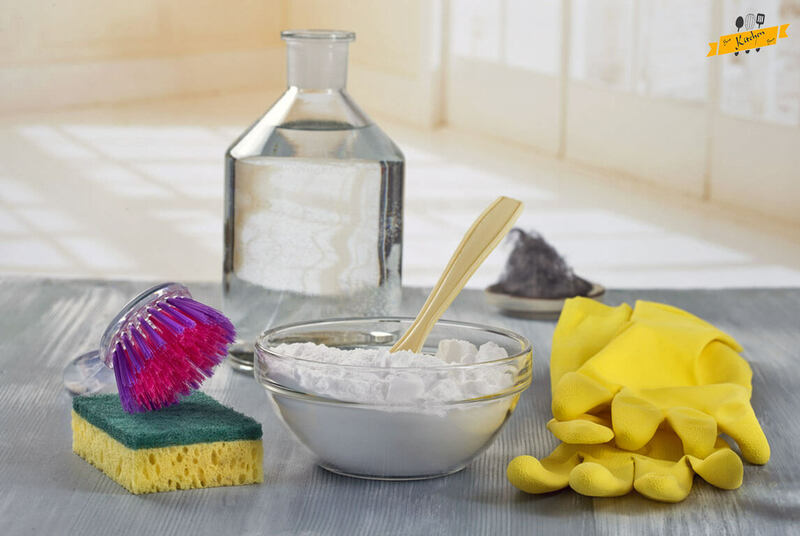 If the white residue is due to hard water, then try to fix this issue by using vinegar, lemon juice, baking soda or other natural or chemical cleansers that clean hard water. We advise you to add a cup of plain vinegar in the dishwasher and run a cleaning cycle once in a month and of course with no dishes inside. Putting too much of detergent could also cause this white residue problem. This is because using too much detergent would create lots of soapsuds and also the appliance may find it tough to wash it away. That’s why we recommend you to fill only half of the detergent’s compartment. Also, use a typical dishwasher gel which creates much lesser bubbles. Another cause could be due to not getting enough hot water. If the water is not sufficiently hot, then the detergent would not dissolve completely and therefore would leave white residue on dishes.To avoid this problem, make sure your appliance comes with a hot water option or check if your home’s geyser runs properly. Hope this article has been helpful. Let us know if you have any other queries regarding your dishwasher in the comment section.